As we are well into the New Year now, the entire email fraternity is looking forward to some exciting advancements in emails. Email has remained the workhorse of visual and interactive marketing and it will get more attention and credit in the coming years. With the emergence of innovations in the designing realms, the efficiency level of email marketing has nowhere to go but up. That said, let’s demystify the email design trends that will rock the email space in 2019. APNG, an extension of the Portable Network Graphics format, provides support for animated images. APNG and GIFs are quite similar in that both are lossless formats. The main advantage of using APNG in emails is that it supports 24-bit colours and eight-bit alpha transparency. As GIFs support eight bits per pixel for images, the quality of the image gets highly compromised. To remove the barriers in accessing emails and make it easier for everyone in your potential target group to read the emails, accessible email design is becoming more important. It helps in the creation of more readable content and design through which email marketers are able to reach one and all, including the specially abled subscribers. Smarter gamification principles will be applied in the emails to drive better subscriber engagement. You can include a reward or incentive-based game right in the emails. This will also enhance the overall email experience for the recipient. Usually, emails include a header image followed by a succinct copy, CTA and footer. Your subscribers have got accustomed to this kind of layout. 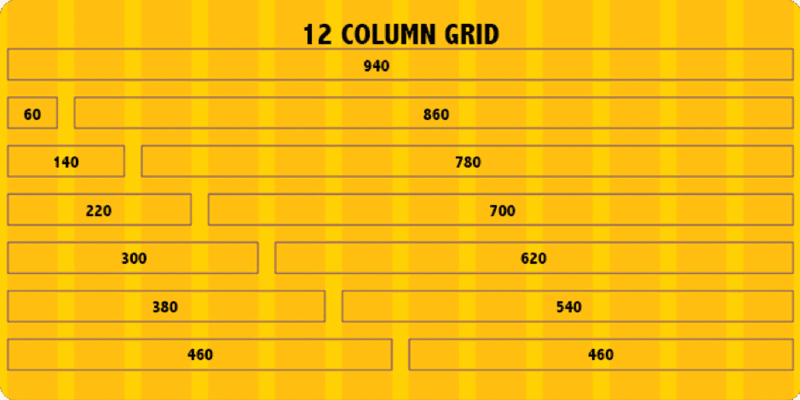 Therefore, email marketers will take a novel approach and create a broken grid layout rather than a 12-column grid shown below. 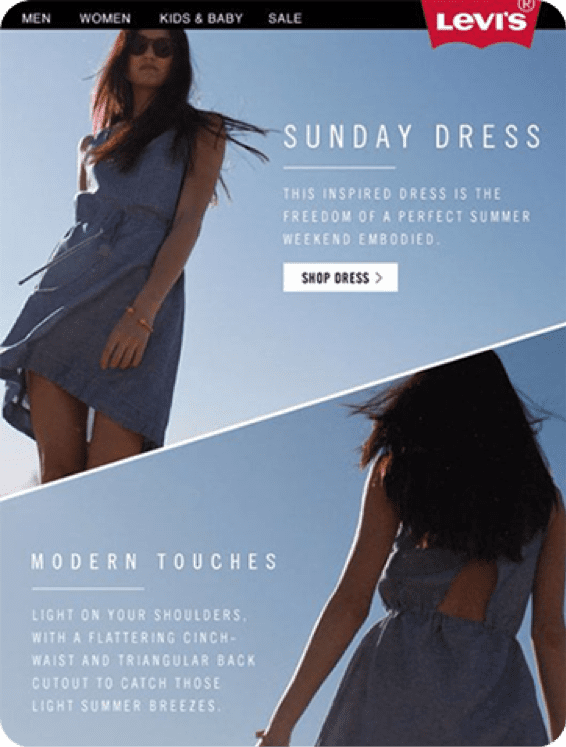 Levi’s breaks the monotony and creates a visually attractive email that does not follow the conventional column layout. In 2019, we expect more full-width emails to be designed, that will make better use of the available space. AMP (Accelerated Mobile Pages) is a new technology that will revolutionize the way emails are designed. An AMP-powered email allows the subscribers to update the required information in the email itself. Such emails will enhance the subscriber engagement to a great extent by delivering fresh content whenever it gets opened. Not many brands have adopted this technology as of now, but you can be the early adopter if you have maximum Gmail users in your list. Barring these five trends, there are some trends that have been used in the previous year and are here to stay. Interactivity will soar to new heights in the email marketing world as developers will go beyond hover and click. Mailable microsites will be in trend and that will give an impetus to more informative emails. Kinetic designs will continue to be an effective tactic in the email marketing world. Experimenting with different types of font styles will continue to be a fad among marketers even in the coming year. E-commerce and retail brands have cashed in on innovative fonts to highlight their offers and have yielded great results. Personalization has not remained a new concept. Most of the brands are using first-name personalization in their emails. In addition to the first name, marketers are also using dynamic content blocks to send more relevant content to the subscribers. The data in the email will be dynamically fetched based on the subscriber preferences. This functionality has paved avenues for more informative emails. The look and feel of email have changed over the years and it has been fascinating to see how emails are evolving. Email clients have also welcomed the changing trends and become more developer-friendly than they used to be. There is a huge playground to explore and emails ought to get even better in the days to come. What do you think? What’s your favorite trend? Find out more about the email trends set to be big in 2019 with Email Monks' latest infographic. Kevin George is the Head of Marketing at EmailMonks – one of the fastest growing Email design and coding companies, specializes in crafting beautiful email templates, PSD to HTML email conversion and free HTML email templates. He loves gadgets, bikes, jazz, and breathes ‘email marketing’. He enjoys sharing his insights and thoughts on email marketing tips and best practices at his email marketing blog.